There can be few more peaceful places than Llanynys Church. This ancient church, the old mother church of the southern Vale of Clwyd, is one of the most interesting churches in North Wales. It is bounded by fields, the only other buildings near the church being a pub and a small cluster of houses. 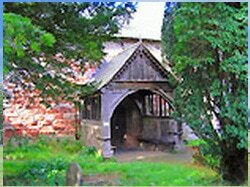 There is a yew tree in the churchyard which is said to be at the centre point of the Vale of Clwyd. Llanynys Church has its origins in the 6th century when it was founded by Saeran a Celtic saint bishop. Parts of the present church date from the 13th century. The most famous feature of the church is a 15th century wall painting of St Christopher. This was discovered in 1967. St Christopher is the patron saint of travellers. There is an Elizabethan panel near the altar with interesting carvings and a fine Georgian chandelier. The church also has a dog tong, which were used to keep fighting dogs in order during church services! The village of Rhewl, 2 miles north of Ruthin on the main A525 is in the parish of Llanynys, so St Saeran's is Rhewl's parish church too.